The free-for-all upgrade to Windows 10 from Windows 7 and Windows 8.1 has officially ended on July 29th, 2016, with the concurrent termination of “Get Windows 10” (GWX) update campaign. If you didn’t take advantage of the free Windows 10 upgrade offer during the promotion period, or was unable to upgrade the Windows 7 or Windows 8.1 to Windows 10 for free, but now has a change of heart and want to install Windows 10, it’s still possible to use certain ‘loophole’ provided by Microsoft to upgrade Windows 7 and Windows 8 / Windows 8.1 to Windows 10 for free. There are several workarounds to get your hand on Windows 10 for free. Most of the time, the tricks to download and install Windows 10 for free are provided by Microsoft to specific group of users, but no check or verification whatsoever is been done. The leniency is probably a way for Microsoft to continue moving users on Windows 7, Windows 8 and Windows 8.1 to Windows 10 in view of slowing migration rate. Windows 10 has improved greatly on accessibility features to help users who need help accessing a computer. The “Ease of Access” center provides various tools such as narrator, a screen reader that reads all the elements on the screen like text and buttons, magnifier, high contrast, closed caption, on-screen keyboard, sticky keys, filter keys, toggle keys, mouse keys, pointer size and many more, all of which is improved against previous versions of Windows operating systems. As such, users who use assistive technologies can continue to upgrade to Windows 10 for free, with no end date in plan. Best of all, there is no verification or check on whether you’re actually using any assistive technologies (even if it does, it’s easy to just enable or turn on any Easy of Access option temporarily), effectively allowing anyone and everyone to gain free Windows 10 upgrade. The setup installer downloaded is the similar to Windows 10 Update Assistant that Microsoft provided for everyone else to upgrade Windows 10 to next major release or upgrade to Windows 10 during the free upgrade offer period. The main difference is that after July 29th, 2016, the Windows 10 Update Assistant downloaded from Microsoft’s Accessibility portal can continue to grant new Windows 10 digital license on computer that never run Windows 10, as long as you have a valid Windows 7 or Windows 8.1 license. The free Windows 10 upgrade offer is not applicable for Windows 7 Enteprrise, Windows 8 Enterprise, Windows 8.1 Enterprise, Windows RT or Windows RT 8.1. 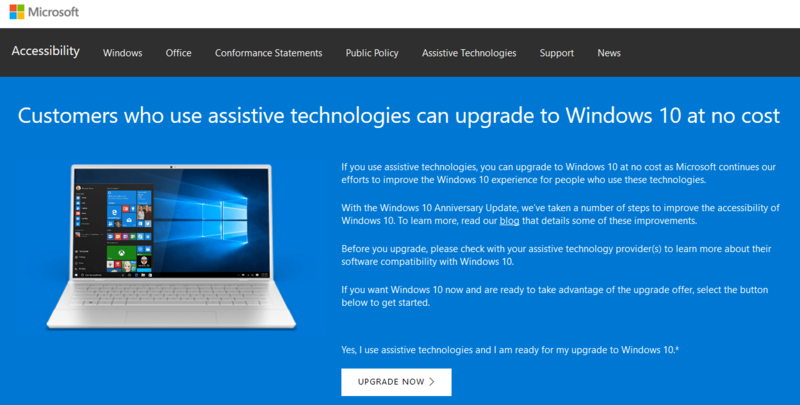 Update: Windows 10 free upgrade for assistive technologies users ends on December 31st, 2017. Microsoft allows product keys of Windows 7, Windows 8 and Windows 8.1 to be used to install and activate installed copy of Windows 10, even though the product keys are new and never used in Windows OS that upgraded to Windows 10. The generous offer for Windows 10 activation continues to work after the free Windows 10 upgrade offer expired. 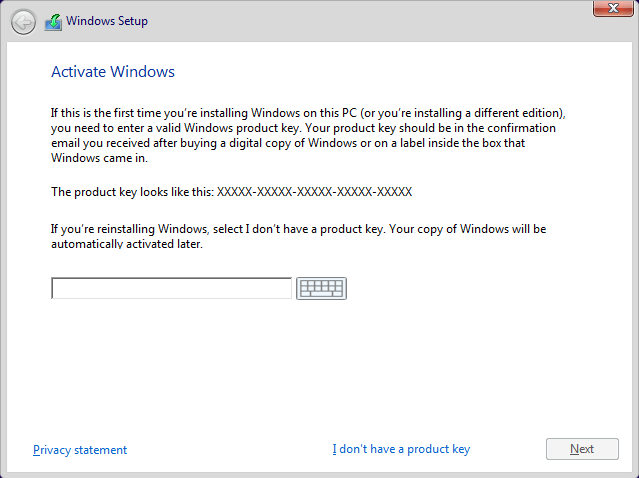 To use Windows 7, Windows 8 or Windows 8.1 product key to install and activate Windows 10, the legitimate product key must be entered during the Windows 10 setup installation process. Once installation is done, Windows 10 would report the entered product key to Microsoft and the activation server would assign a digital license (previously known as digital entitlement) to use Windows 10 for free, similar to if you perform an upgrade. 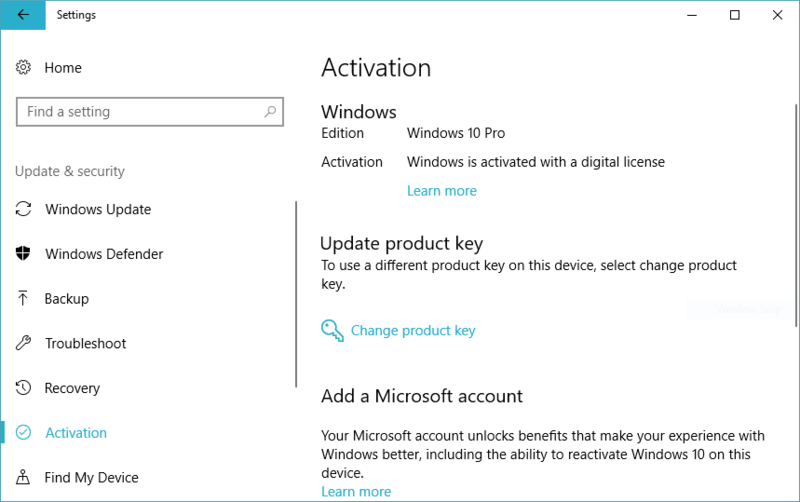 Make sure that you enter the product key or CD key during the Windows 10 setup as entering the Windows 7 / Windows 8 / Windows 8.1 product key in Settings -> Update & Security -> Activation to activate Windows 10 after installed no longer work. Both retail and OEM editions of Windows 7 / 8 / 8.1 product key are accepted by Windows 10 installer. If you don’t know your product key, you can use various tools to retrieve or recover product keys and serial numbers. For Windows 10 installer to ask for product key during installation, you need to create Windows 10 installation media in the format of bootable USB flash drive or burn a bootable DVD using the Media Creation Tool available on https://www.microsoft.com/en-us/software-download/windows10. Then, restart the PC and boot from the installation media. Proceed to install Windows 10 by performing an upgrade that keeps existing files and programs, or a clean install that starts afresh. When prompted, enter the Windows 7, Windows 8 or Windows 8.1 key. Windows 10 setup installer will accept the product key and complete the installation and activation automatically on boot up. Performing in-place upgrade or installation (running setup.exe in ISO image from within existing Windows OS) may not trigger the prompt to enter product key for activation. In such case, boot from installation media to start the installation. Once installation or upgrade is completed, you can verify that the Windows 10 has been successfully activated and a free digital license has been assigned to the PC by visiting Settings -> Update & Security -> Activation, where activation status is listed as “Windows is activated with a digital license”.